Image copyright © Susie Mann. All rights reserved. What could be more entertaining than going to watch AS Roma play soccer at Stadio Olimpico. Find a list of golf courses located in and around Rome. Click on a particular golf club to get more information about the facility and what it has to offer. If you enjoy volleyball then you may want to find out when this team takes the court at palazzetto dello sport. The club was formed in 1960 and is a prominent Italian basketball team that plays in Serie A. This annual tennis tournament is held in May at the Foro Italico tennis park. 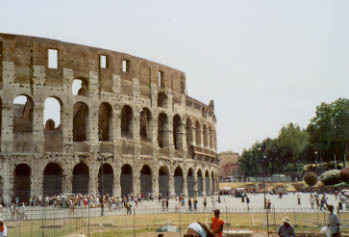 Soccer is always king in Rome & Italy, but Romeguide has put together a nice section devoted to sports in Rome. At the bottom of this section is a nice list of parks and what each offers. The official web site for this soccer team which plays in the Serie A class. This club competes in the top division of Italian rugby and play their games at the Stadio Flaminio.